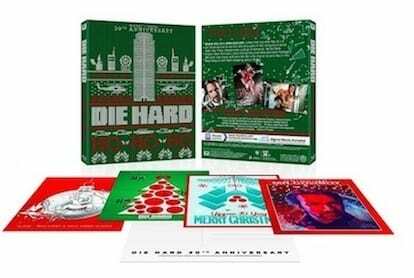 Like putting up decorations, baking gingerbread, and zoning out to avoid processing your relatives' political views, the argument over whether or not Die Hard is a Christmas movie has become a seasonal tradition. This year is no exception. There have been polls, podcasts, even music videos devoted to the topic. Which is dumb. It's a dumb debate! That being said, we're going to throw in our two cents in a desperate effort to put an end this madness. Part of the reason a debate over whether or not Die Hard is a Christmas movie is A) asinine and B) impossible is that there's no working definition of what a Christmas movie actually is. The canon of Christmas movies covers a wide range of diverse subjects, from a boy desperately craving a firearm to random British people hooking up to a green mutant and his pet dog burgling an entire town out of spite. The only thing linking them all is a Christmas setting. Die Hard fits that bill. It does take place on Christmas. But a lot of its elements are decidedly un-Christmasy -- like machine guns, explosions, and a slimy cokehead who dies before anyone exclaims that his shiny red nose could help them in bad weather. Still, Die Hard has a redemptive arc for its hero, not dissimilar from other great Christmas stories. Like Ebenezer Scrooge in A Christmas Carol, John McClane finds his Christmas Eve interrupted by uninvited visitors, and due to their intervention, he learns to be a less selfish person. Both characters' epiphanies come when they're forced to confront their mortality. Scrooge repents at the site of his future gravestone, and McClane realizes he owes his wife Holly an apology while picking shards of broken glass out of his feet. So if Die Hard is set at Christmas and explores similar themes to classic Christmas tales, why is this a thing people are even talking about? Well, for one thing, Die Hard wasn't released at Christmas. It was a summer blockbuster, hitting theaters in July 1988. All that Christmas business was merely a function of the plot, not a selling point of the movie. Most of the Christmas movies we love were actually released during the holiday season. But not all. For example, despite the fact that Miracle On 34th Street is literally about a guy claiming to be Santa Claus, it was released in May. Why? Because the head of 20th Century Fox thought it would make more money in the summertime. This strategy involved making the Kris Kringle character as tiny as possible on the poster, and releasing an intentionally vague trailer that didn't actually feature any footage from the movie itself. So how did Miracle On 34th Street go from a hit summer comedy to a Christmas classic? In December of the same year, the stars reunited for a radio adaptation. Then again the following year. Made-for-TV remakes popped up in the '50s and '70s, all releasing at Christmastime. Even what many consider the definitive Christmas movie, It's A Wonderful Life was supposed to be released in January, and was only moved to December so it could compete in the Oscars. Still, it wasn't considered a Christmas movie, even by its director. "I didn't even think of it as a Christmas story when I first ran across it," said Frank Capra. "I just liked the idea." George Bailey's sloppy suicide attempt only became a holiday staple after a screw-up with the film's copyright landed it in the public domain in 1974. TV stations turned it into a perennial Christmas favorite because it was practically free to air. So other films became what we consider Christmas movies because the powers that be shifted strategies and began marketing them that way. And that's exactly what's been happening with Die Hard recently. Take the 30th anniversary Blu-ray which came out this year. It has festive artwork and even actual Christmas cards inside. Last year, we got a Night Before Christmas-style children's book about that fateful night at Nakatomi Plaza, presumably for parents who are sick and tired of how no one falls to their death at the end of The Polar Express. These aren't legally spurious Etsy products, but officially licensed items. 20th Century Fox, like it did for Miracle On 34th Street and what cheapness did for It's A Wonderful Life, is giving its movie a new context. If those films were allowed to make the transition, by the same logic, so should Die Hard. Perhaps the true meaning of Christmas movie-dom is not what's in the movie itself, but in whether or not our corporate overlords try to cram it out down our throats during the holiday season. If the studio wants to tout a film's festiveness in order to con you out of your hard-earned money, then guess what? That makes it a Christmas movie. U-S-A! U-S-A! For more, check out Benicio Del Toro Is The 'Dora The Explorer' Movie's Bad Guy and Who's The Girl With The Spider-Robot In 'Spider-Verse'? Follow us on Facebook, Mother Cluckers.